" 61 If you will keep in mind what the Holy Spirit offers you, you cannot be vigilant for anything but God and His Kingdom. The only reason you find this difficult is because you think there is something else." 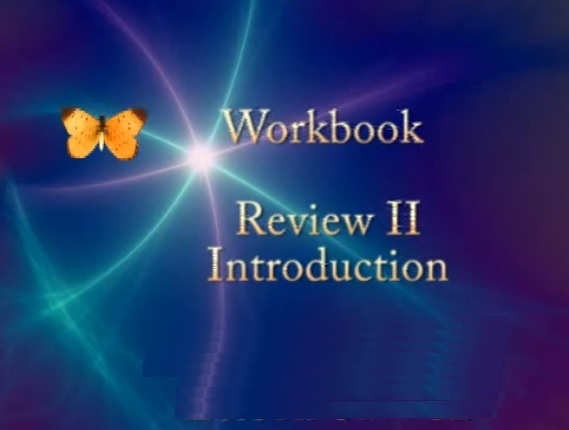 1 We are now ready for another review. We will begin where our last review left off and cover two ideas each day. The earlier part of each day will be devoted to one of these ideas, and the latter part of the day to the other. We will have one longer exercise period and frequent shorter ones in which we practice each of them. 2 The longer practice periods will follow this general form: take about 15 minutes for each of them, and begin by thinking about the idea and the comments which are included in the assignments. Devote about three or four minutes to reading them over slowly, several times if you wish, and then close your eyes and listen. Repeat the first phase if you find your mind wandering, but try to spend the major part of the practice period listening quietly but attentively. 3 There is a message waiting for you. Be confident that you will receive it. Remember that it belongs to you and that you want it. Do not allow your intent to waver in the face of distracting thoughts. Realize that, whatever form they take, they have no meaning and no power. Replace them with your determination to succeed. Do not forget that your will has power over all fantasies and dreams. Trust it to see you through and carry you beyond them all. 4 Regard these practice periods as dedications to the way, the truth, and the life. Refuse to be side-tracked into detours, illusions, and thoughts of death. You are dedicated to salvation. Be determined each day not to leave your function unfulfilled. 5 Reaffirm your determination in the shorter practice periods as well, using the original form of the idea for general application and a more specific form when needed. Some specific forms will be included in the comments. These, however, are merely suggestions. It is not the particular words you use that matter. 2 How holy am I, who have been given the function of lighting up the world! Let me be still before my holiness. In its calm light, let all my conflicts disappear. In its peace, let me remember who I am. 4 Let me not obscure the light of the world in me. Let the light of the world shine through this appearance. This shadow will vanish before the light. Forgiveness is my function as the light of the world. 5 It is through accepting my function that I will see the light in me. And in this light will my function stand clear and perfectly unambiguous before my sight. My acceptance does not depend on my recognizing what my function is, for I do not yet understand forgiveness. Yet I will trust that in the light I will see it as it is. 7 Let this help me learn what forgiveness means. Let me not separate my function from my will. I would not use this for an alien purpose. 54 Although you can love the Sonship only as one, you can perceive it as fragmented. It is impossible, however, for you to see something in part of it that you will not attribute to all of it. That is why attack is never discrete and why attack must be relinquished entirely. If it is not relinquished entirely, it is not relinquished at all. Fear and love are equally reciprocal. They make or create, depending on whether the ego or the Holy Spirit begets or inspires them, but they will return to the mind of the thinker, and they will affect his total perception. That includes his perception of God, of His creations, and of his own. He will not appreciate any of them if he regards them fearfully. He will appreciate all of them if he regards them with love. 55 The mind that accepts attack cannot love. That is because it believes that it can destroy love and therefore does not understand what love is. If it does not understand what love is, it cannot perceive itself as loving. This loses the awareness of being, induces feelings of unreality, and results in utter confusion. Your own thinking has done this because of its power, but your own thinking can also save you from this because its power is not of your making. Your ability to direct your thinking as you will is part of its power. If you do not believe you can do this, you have denied the power of your thought and thus rendered it powerless in your belief. 56 The ingeniousness of the ego to preserve itself is enormous, but it stems from the power of the mind, which the ego denies. This means that the ego attacks what is preserving it, and this must be a source of extreme anxiety. That is why the ego never knows what it is doing. It is perfectly logical but clearly insane. The ego draws upon the one source which is totally inimical to its existence for its existence. Fearful of perceiving the power of this source, it is forced to depreciate it. This threatens its own existence, a state which it finds intolerable. 57 Remaining logical but still insane, the ego resolves this completely insane dilemma in a completely insane way. It does not perceive its existence as threatened by projecting the threat onto you and perceiving your being as nonexistent. This ensures its continuance if you side with it by guaranteeing that you will not know your own safety. The ego cannot afford to know anything. Knowledge is total, and the ego does not believe in totality. This unbelief is its origin and, while the ego does not love you, it is faithful to its own antecedents, begetting as it was begotten. 58 Mind always reproduces as it was produced. Produced by fear, the ego reproduces fear. This is its allegiance, and this allegiance makes it treacherous to love, because you are love. Love is your power, which the ego must deny. It must also deny everything which this power gives you because it gives you everything. No one who has everything wants the ego. Its own maker, then, does not want it. Rejection is therefore the only decision which the ego could possibly encounter, if the mind which made it knew itself. And if it recognized any part of the Sonship, it would know itself. 59 The ego therefore opposes all appreciation, all recognition, all sane perception, and all knowledge. It perceives their threat as total because it senses the fact that all commitments the mind makes are total. Forced, therefore, to detach itself from you who are mind, it is willing to attach itself to anything else. But there is nothing else. It does not follow that the mind cannot make illusions, but it does follow that if it makes illusions it will believe in them, because that is how it made them. 60 The Holy Spirit undoes illusions without attacking them merely because He cannot perceive them at all. They therefore do not exist for Him. He resolves the apparent conflict which they engender by perceiving conflict as meaningless. We said before that the Holy Spirit perceives the conflict exactly as it is, and it is meaningless. The Holy Spirit does not want you to understand conflict; He wants you to realize that, because conflict is meaningless, it cannot be understood. We have already said that understanding brings appreciation, and appreciation brings love. Nothing else can be understood because nothing else is real, and therefore nothing else has meaning. 61 If you will keep in mind what the Holy Spirit offers you, you cannot be vigilant for anything but God and His Kingdom. The only reason you find this difficult is because you think there is something else. Belief does not require vigilance unless it is conflicted. If it is, there are conflicting components within it which have engendered a state of war, and vigilance therefore has become essential. Vigilance has no place at all in peace. It is necessary against beliefs which are not true and would never have been called upon by the Holy Spirit if you had not believed the untrue. You cannot deny that, when you believe something, you have made it true for you. 62 When you believe what God does not know, your thought seems to contradict His, and this makes it appear as if you are attacking Him. We have repeatedly emphasized that the ego does believe it can attack God and tries to persuade you that you have done this. If the mind cannot attack, the ego proceeds perfectly logically to the position that you cannot be mind. By not seeing you as you are, it can see itself as it wants to be. Aware of its weakness, the ego wants your allegiance, but not as you really are. The ego therefore wants to engage your mind in its own delusional system, because otherwise the light of your understanding would dispel it. 63 The ego wants no part of truth because the truth is that the ego is not true. If truth is total, the untrue cannot exist. Commitment to either must be total, since they cannot coexist in your minds without splitting them. If they cannot coexist in peace and if you want peace, you must give up the idea of conflict entirely and for all time. [This requires vigilance only as long as you do not recognize what is true.] While you believe that two totally contradictory thought systems share truth, your need for vigilance is apparent. Your minds are dividing their allegiance between two kingdoms, and you are totally committed to neither. 64 Your identification with the Kingdom is totally beyond question, except by you when you are thinking insanely. What you are is not established by your perception and is not influenced by it at all. All perceived problems in identification at any level are not problems of fact. They are problems of understanding, since they mean that you believe what you can understand is up to you to decide. The ego believes this totally, being fully committed to it. It is not true. The ego therefore is totally committed to untruth, perceiving in total contradiction to the Holy Spirit and to the knowledge of God. 65 You can be perceived with meaning only by the Holy Spirit because your being is the knowledge of God. Any belief that you accept which is apart from this will obscure God's Voice in you and will therefore obscure God to you. Unless you perceive His creation truly, you cannot know the Creator, since God and His creation are not separate. The Oneness of the Creator and the creation is your wholeness, your sanity, and your limitless power. This limitless power is God's gift to you, because it is what you are. If you dissociate your mind from it, you are perceiving the most powerful force in the universe [of thought] as if it were weak because you do not believe you are part of it. 66 Perceived without your part in it, God's creation is perceived as weak, and those who see themselves as weakened do attack. The attack must be blind, however, because there is nothing to attack. Therefore, they make up images, perceive them as unworthy, and attack them for their unworthiness. That is all the world of the ego is— nothing. It has no meaning. It does not exist. Do not try to understand it, because if you do you are believing that it can be understood and is therefore capable of being appreciated and loved. That would justify it, and it cannot be justified. You cannot make the meaningless meaningful. This can only be an insane attempt. 67 Allowing insanity to enter your minds means that you have not judged sanity as wholly desirable. If you want something else, you will make something else, but because it is something else, it will attack your thought system and divide your allegiance. You cannot create in this divided state, and you must be vigilant against this divided state, because only peace can be extended. Your divided minds are blocking the extension of the Kingdom, and its extension is your joy. If you do not extend the Kingdom, you are not thinking with your Creator and creating as He created. 68 In this depressing state, the Holy Spirit reminds you gently that you are sad because you are not fulfilling your function as co-creators with God and are therefore depriving yourselves of joy. This is not God's Will but yours. If your will is out of accord with God's, you are willing without meaning. Yet because God's Will is unchangeable, no real conflict of will is possible. This is the Holy Spirit's perfectly consistent teaching. 69 Creation, not separation, is your will because it is God's, and nothing that opposes this means anything at all. Being a perfect accomplishment, the Sonship can only accomplish perfectly, extending the joy in which it was created and identifying itself with both its Creator and its creations, knowing they are one. Now we review the Lessons of the last twenty days. This time, we do one Lesson, "I am the light of the world," (W.61) in the morning and the next Lesson, "Forgiveness is my function as the light of the world," (W.62) in the afternoon. The focus of the review is to read the thoughts over slowly for three or four minutes, then close your eyes and listen "quietly but attentively." (W.PartI.ReviewII.IN.3.1) We are asked to be confident that we will hear. Set your intention and determination to succeed in hearing the message that is waiting for you. "Do not forget that your will has power over all fantasies and dreams." (W.PI.RII.IN.4.4) We are also asked to, "Regard these practice periods as dedications to the way, the truth and the life. Refuse to be sidetracked into detours, illusions and thoughts of death." (W.PI.RII.IN.5.1-2) Each day we focus on our function of forgiveness. Finally, he reminds us in our review of the comments that follow each idea for the day, "It is not the particular words you use that matter." (W.PI.RII.6.4) This is important in that we are not trying to be good students who do what the teacher asks of us to the letter of the law. There are no tests to pass, and ritualistic study is not helpful. It is all about our devotion, dedication, and sincerity in how we approach these lessons. Our focus now is all about purpose. Jesus says, "It [the resurrection] is the relinquishment of all other purposes, all other interests, all other wishes and all other concerns." 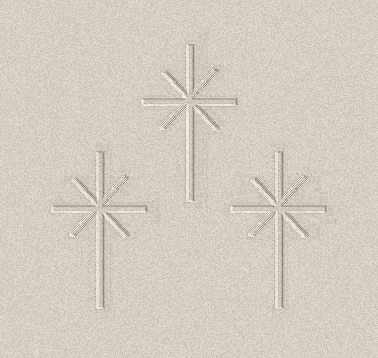 (M.28.1.9) This means it is important to clear away anything that distracts us from our purpose to know our Christ Self. Desire and devotion are what is important. If our desires are still for the things of this world, our attention will not be focused. So, to the extent we can, we recognize the importance of what we are doing and just keep our focus fixed on our goal of awakening. I recently read an account by a friend who said this process was like churning butter. It seems that in the process of churning, nothing is happening, but you keep doing the churning and one day all of a sudden you have butter. In the morning, I remind myself, "I am the light of the world." (W.61) This is what I want to demonstrate so everyone I encounter is made happier by my presence. The light can only shine through me when I am willing to see my blocks to love, take responsibility for them, and bring them forward for healing. In the Prayer of St. Francis, we read, "Make me a vessel of your peace; where there is darkness, let me bring light." Our own darkness keeps the light away. The light is always there behind our dark ego thoughts. The light shines through us when we focus daily on our function of forgiveness. It is our only reason to be here. "How holy am I, who has been given the function of lighting up the world!" (W.81.1.2) Then, "Let me be still before my holiness." (W.81.1.3) It is like coming before a vision of a great spiritual being, yet it is our own holiness we come before with a sense of humility and receptiveness. This holiness shines its calm light and brings a deep peace within our own minds, where all conflicts we hold in the mind disappear. From that place of truth within, we become a radiant reflection of God's Love in the world. We are given, "Some specific forms for applying this idea when difficulties seem to arise. . ." (W.81.2.1) When difficulties arise, we often give them a lot of power, and this keeps us in hell. Yet we have been given a remedy here. We willingly bring our perceptions of darkness to the truth where they are shined away. Our interpretations of the situation will always be wrong and driven by the ego, but we are reminded they cannot obscure the light in us. They have no power when we choose the truth. Difficulties are illusions, and thus they are nothing unless we make them into something. For the latter part of the day, we focus on the second Lesson, "Forgiveness is my function as the light of the world." (W.62) "It is through accepting my function that I will see the light in me." (W.81.3.2) Only by bringing illusions to the truth can we experience the light in our minds consistently. If we get distressed about anything today, we are reminded that every distress is just another opportunity to forgive. The world is our classroom to help us remember who we are. We can only do that when we bring the darkness in our minds to the light of truth. "Realize that, whatever form such [distracting] thoughts may take, they have no meaning and no power." (W.PI.RII.IN.4.2) We are asked to replace our distracting thoughts with our determination to succeed. The power of our minds is aligned with God's power. "Do not forget that your will has power over all fantasies and dreams." (W.PI.RII.IN 4.4) It is not our own power but the power of truth within us. Every irritation, every frustration, and every distraction is just another opportunity to forgive. Although I do not understand forgiveness, "Yet I will trust that, in the light, I will see it as it is." (W.81.3.5) Meanwhile, we just need to look at every difficult situation in our lives, and let each one teach us what forgiveness is. We just keep doing the practice laid out in these lessons, and the light will dawn on our mind more and more. We don't really get forgiveness as described in the course because we think it means overlooking something real that someone has actually done or that we have done. We do not yet recognize that nothing real has happened, and we are only applying forgiveness to our own misperceptions of what we see and experience. When we experience the light and fully understand forgiveness based on the recognition that nothing is outside of our own minds, we will have made great progress in our awakening. Jesus reminds us, "You are still convinced that your understanding is a powerful contribution to the truth, and makes it what it is. Yet we have emphasized that you need understand nothing." 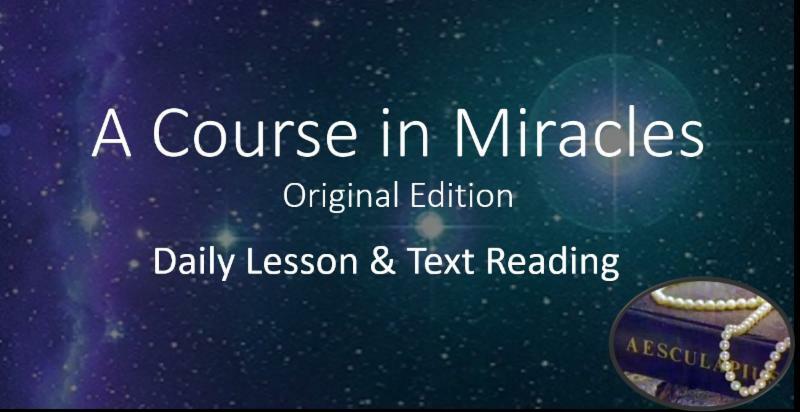 (T.18.IV.7.5-6) (ACIM OE T.18.V.39) He reminds us that not only do we not need to understand, but our attempts to do so can actually get in the way. "Salvation is easy just because it asks nothing you cannot give right now." 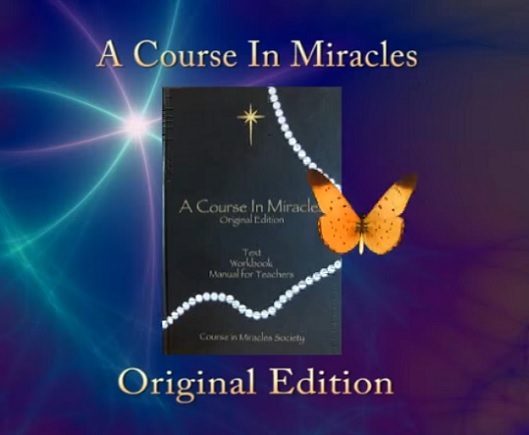 (T.18.IV.7) (ACIM OE T.18.V.39) What we can give right now is our acceptance and appreciation of every event and circumstance in our lives as another opportunity to learn how to forgive. It is also to accept that nothing is outside of our own minds. The world is a witness to what is going on in us. I was doing this Lesson some time ago when a situation came up that really brought this home for me. I got up very early for an appointment with the dentist, which I was really happy about as I was anxious to get the final stages of dental work done after having fallen and broken several teeth. I had gone through a long and arduous, not to mention expensive, process to get all the work done and was at my final appointment to have the temporary teeth replaced with implants; and this would conclude a seemingly long and difficult journey. It would have been like an anniversary, as I had fallen in April, three years prior. I got to the office but was kept waiting, which was very unusual. I started to sense something was wrong, and I was finally told that the implants were not ready. Furthermore, I was told that I could not get another appointment until late May! There was no explanation as to what the problem was nor why the delay. As the frustration arose in me, I remembered the Lesson, "Let me recognize my problems have been solved." (W.80) It did not feel that way at the moment, yet I was willing to accept that I was giving this situation my interpretation, and I really did not know what it was for. The chatter continued in my mind and anger arose at having had to get up so early, driving all the way downtown, paying for parking, and feeling very inconvenienced. I kept asking for help to see it another way, to just accept the situation and to let it go. I asked the Holy Spirit to help me see everything in the light of love and to extend that thought through me with whomever I might encounter in my day. Having missed breakfast, I decided to go to a diner. I ordered breakfast and chatted with a lovely server and started to read Chapter 8 III (ACIM OE T.8.IV) "The Holy Encounter." Shortly after ordering breakfast, a couple walked in whom I had not seen for perhaps 15 years or so. They are two practicing psychologists whom I dearly love. They wanted to know what I was doing these days. I mentioned the Course and the "Power of Clearing" sessions I do, and they wanted to know more and asked for my phone number so we could connect. It was a lovely encounter that I would have missed if my implants had been ready. I reminded myself of the many times I chose to stay in distress rather than choose to forgive and apply the Lesson immediately when I seemed to encounter difficulties. I wondered what the meaning of this encounter was and its importance, but I recognized I had no idea. Everything is in His hands. I don't need to try to figure it out. I just recognized the perfection of it all and my joy at having the opportunity to meet once again with my friends. In every situation, we can choose to remember who we are and what our function is in this world. These are the kinds of events that give us the opportunities we need to practice remembering the truth and to enhance our motivation. What situations or difficulties do you face today that could be transformed in the light of truth? What expectations do you need to release in order to experience peace? It is good to pick a time of day when you plan to start the second Review Lesson, or you might find the day just slips by and you haven't given it the attention it requires. We continue with the process we have been using in our practice periods so far where we take a longer practice period twice a day. Now we will be focusing one of our longer practice periods on the morning Lesson and the second one in the afternoon. Watch how your days go during this review period. Notice how often you forget, which is an indication of how much resistance there is in the mind, but don't judge yourself when you do forget. It is just another opportunity to notice your fear of awakening. 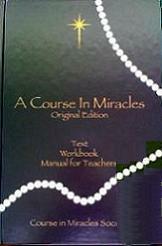 LISTEN every day to Guidance on the ACIM Lessons from Jesus. Presently all CIMS projects are supported by free will gifts of time, talent, and money. If you would like to support any of the activities of the Society in any way, please do not hesitate to get in touch. Because of the international character of CIMS, the internet is our primary means of communicating and collaborating. To make a Tax-Deductible Donation in support of the Daily Lessons just click Here. Also, by means of your will or other estate plan, you can name " Course in Miracles Society" as the beneficiary of a portion of your estate, or of particular assets in your estate. 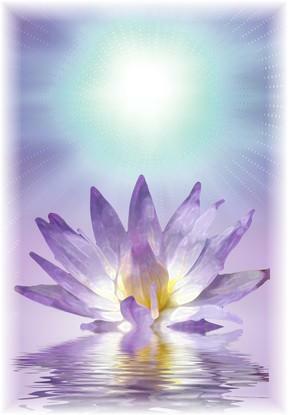 In this way, you are honoring your loved ones while also providing critical support to the extension of LOVE. 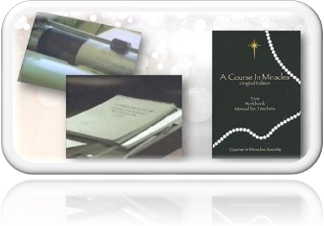 SHARE THE BLESSING of ACIM!